I have found one or two people I consider friends who don't like the Beatles and about the same number who don't love To Kill a Mockingbird. I love them anyway, but I don't exactly understand. I got my first word of Harper Lee's death last week from a former student's text. Over the next day or two, I noticed how many other messages I heard from friends, former students, colleagues, and kin, all wanting to react to the news. I couldn't help wondering if everyone's Facebook carried the same quantity of information on Lee's death or did the algorithms load other people's feed with sports, politics, or the Kardashians? I read the book first in high school, maybe junior high. I taught it for many years of my high school teaching career--before the ninth grade teachers claimed it as their own. I remember hearing Kylene Beers telling that her daughter was assigned the book three years in a row, as a result of school changes, loving it each time. The third year, she told her mom, "I think the version we're reading this year is better." "No," Kylene said she told her. "The book is the same. You're a better version of yourself now." One of the charms of this book is that it stands up to multiple reading. Even as it grows more familiar, it moves readers. Scout makes me laugh sometimes. She makes me cry. I love Atticus and respect him, while recognizing that he's not a perfect father. His own integrity puts his children in danger. When the stage version of the novel was performed at the Zodiac Theatre in Florence, Alabama, my hometown, I remember hearing that Miss Lee--Nelle to her family and friends--had written part of the book in our town, where her college roommate lived. Some said she might attend the play, but would keep a low profile. Part of her charm was her avoidance of the spotlight. Had she been born later, I still doubt she would have tweeted. The stories about her, as a result, developed legendary status. I never got to meet her. I covet a signed copy of the book, but I'm content with my paperback copy held together by rubber bands. From what I'm hearing from friends over the last several days, others still hold on to their own school copies. I wonder how many other books from my required reading lists gain a permanent place on bookshelves instead of being traded to the used bookstore for soft drink money. I might add, too, that while my mantra "The movie was better" holds true, the film of To Kill a Mockingbird is rightfully a classic itself, perfectly cast, perfectly executed. The pieces I would add to the collection are the documentary Hey Boo! and the companion volume Scout, Atticus, and Boo, both the result of a project by Mary McDonah Murphy. I have my own collection. In my literature teaching files, I probably have as much material on Lee and her novel than any other work. I have a videotape made from a reel-to-reel tape from the thirties, made my a gentleman who moved to Monroeville from New Jersey, showing the downtown that served as the model for Maycomb. I have more activities to use with the novel in the classroom than time could every allow. All this for a book I haven't taught in more than 20 years. But I've read it over and over, something I rarely do with so many books still unread. All that's left to do is to take a pilgrimage to Maycomb, to see the play performed in the former courthouse. I'll keep an ear perked for the footfalls of ghosts of Scout and Jem, Calpurnia, Dill. Maybe even Boo Radley will come out. Sometimes my different blogging venues experience some crossover. Over at the Alabama Tar Heel, I'm "hosting" an online book club this year, reading through Gretchen Rubin's The Happiness Project, month by month. This month she focuses on marriage, a Valentine's tribute I imagine. But one thing struck me: she said that since she had started her research on happiness, she had accumulated lots of books on marriage and relationships. Her husband Jamie remarked that people who saw their bookshelves would think they were having marital trouble. That made me wonder what anyone would gather by looking at my book collections. As I shared over at that site, I have a disproportionate number of books on reducing clutter. And they haven't worked. But since I love to organize my books--my own special blend of Dewey Decimal, Library of Congress method, and indie bookstore, I found I had pockets of related books too. Especially as I started packing up and trying to prioritize which books I'd keep within reach and which I'd want to unpack first, found interesting groupings. Tomorrow the moving van will pull into the driveway in our home in Nashville. I dread the unpacking, especially since I know the movers packed up our dirty bath towels when we weren't looking. The biggest challenge, though, will be what to do with my books--all those books--because this house doesn't have the walls of bookshelves--yet. Emily St. John Mandel's Station 11: King Lear, Apocalypse, and the Georgia flu. While I don't necessarily gravitate toward post-apocalyptic novels, they do show up on my radar frequently. 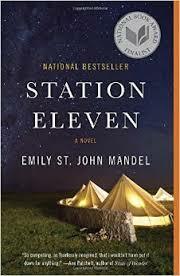 At the end of the year, when I was asking other readers about their best books from 2015, Station Eleven by Emily St. John Mandel kept coming up, so I couldn't resist. The story opens on stage at a performance of King Lear as the lead actor Arthur Leander dies of a heart attack. A former member of the paparazzi, in training to be an EMT, tries unsuccessfully to perform CPR. When he leaves the theatre, he gets the unsettling news from a friend in a nearby hospital, that the flu reported in Russia has found its way via plane to Toronto. He stocks up on groceries and then heads to the high-rise apartment of his brother crippled during service in the Middle East. Kirsten Raymond, a child actress playing one of Lear's daughter as a child who witnesses the death becomes a key character years later, as part of a traveling symphony going from town to town performing Shakespearean plays. The flu that wiped out over ninety percent of the world's population has left the survivors without electricity, once the power grid fails. Cars are abandoned after the gasoline supplies are exhausted, and planes in the sky become just a distant memory. The traveling performers find one of their regular stops at St. Deborah-by-the-Woods, transformed eerily by the presence of a man calling himself The Prophet, spouting random verses from the book of Revelation, and seeking his next wife--usually a young girl. Escaping, the characters find themselves at an old airport where passengers on the last flight into the airport have set up camp and resumed their lives, including one survivor, a friend of the late Arthur Leander, who has set up a museum of artifacts of the former world. Mandel moves the narrative back and forth between the past and present, revealing details of Leander's life, particularly of his failed marriages, and following his former wives and his only son, born to wife number 2, then returning to the post-disaster world. Reading the account of the changed world, one can't help wondering if the existence of knowledge of a higher civilization wouldn't allow a more timely recovery of that lost world. That hope is reflected--just a glimmer--at the climax of the novel. Some of the details of the flu outbreak remind me of my friend Alison Kemper's YA Zombie novel, Donna of the Dead--particularly the possibility of survivors, sailors at sea for instance, untouched by the disease. Having read plenty of accounts--both fiction and fact--about the Medieval plagues, I was intrigued too by the idea of people who are resistant to such disease and their potential for survivor's guilt. The dramatic challenge of the characters as they learn to adapt to the post-flu world intrigued me--but I'm still not convinced to get my flu shot.